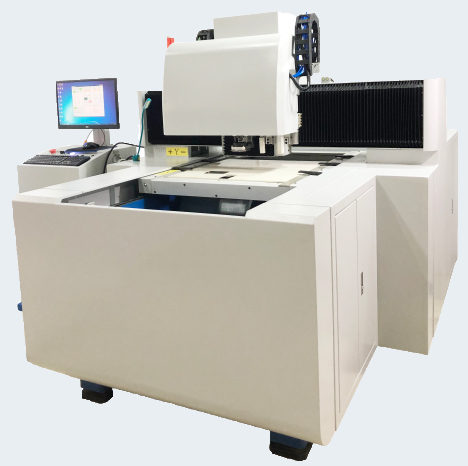 Dongguan Yisong company is scheduled to sell Automatic PVC die sawing machine to both demostic & oversea markets in Print China 2019 during 9th-13th April. We developed automatic die sawing machine since year of 2013, it finally acheives auto saw cutting technology on different materials such as plywood, PVC board, acrylic, MDF, aluminium plate etc, solve the three core problems of high pollution, high cost of use and defects in processing quality caused by the laser cutting machine. For Automatic PVC die sawing machine showed next month, it can be used to cut PVC board, acrylic and plywood, thickness no more than 8 mm. It's mainly designed to make label dies & electronic dies or acrylic dies. It can cut vertical die kerf with tight cutting tolerance less than 5 mm, blade holding on CNC sawing die is more durable for die cutting. Processed plastic die has clean surface without any black laser burnt edge, perfect smoothness, more time-saving to be set up on die cutting machine. Saw blades & electricity consumption are the only consumables, much less machine running cost than laser cutting machine. What's more, there is no corrosive laser fume problem during cutting process, protecting machine from being rusted. Dongguan Yisong company developed “automatic cnc die sawing machine”series for die making industry. The machine's software is of its independent research and development, which is a part of Yisong's intellectual property. “Committed to industries’ problems solving, making efforts on industries’ upgrading and promoting healthy and sustainable development for die board industry.” is our philosophy. Here are the details of the exhibition. We look forward to seeing you on the fair !